In Skyscrapers! With 25 Science Projects for Kids, elementary-aged kids learn about the principles of engineering that are used in building skyscrapers, as well as the history of skyscrapers themselves. Readers also explore the kinds of professionals that contribute to the raising of a skyscraper, from engineers to architects to constructions teams. To answer the burning question on every young engineer's mind--how do skyscrapers stay standing?--readers discover the important designs used to build tall buildings, including the tube frame, the bundled tube frame, and x-bracing. And by following the evolution of skyscraper design, STEAM-focused students learn how structures have become more stable and more complex through the introduction of design elements and new materials. Skyscrapers! is part of a set of four Explore Engineering books. In the Explore Engineering set, readers ages 7 to 10 learn the physics behind the things they build: Why does a tower of blocks eventually fall? Why does a tunnel sometimes cave in? Through a series of focused, science-minded activities that require critical thinking paired with creative trial-and-error attempts at building, readers develop foundational understanding of the physics that guides the building and maintenance of bridges, canals, tunnels, and skyscrapers. Titles in the Explore Engineering set include Bridges! With 25 Science Projects for Kids; Canals and Dams! With 25 Science Projects for Kids; Tunnels! 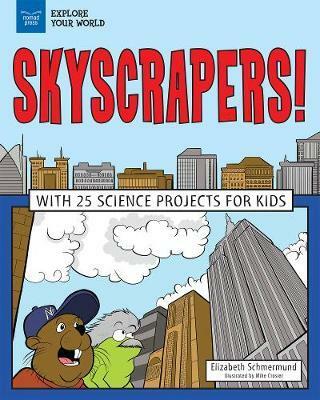 With 25 Science Projects for Kids; and Skyscrapers! With 25 Science Projects for Kids. Nomad Press books in the Explore Your World series for children ages 7-10 integrate content with participation. Common Core State Standards, the Next Generation Science Standards, and STEM Education all place project-based learning as key building blocks in education. Combining content with inquiry-based projects stimulates learning and makes it active and alive. Nomad's unique approach simultaneously grounds kids in factual knowledge while allowing them the space to be curious, creative, and critical thinkers. In Explore Skyscrapers! With 25 Great Projects, kids ages 7 to 10 learn about the principles of engineering that are used in building skyscrapers, as well as the history of skyscrapers themselves. To answer the burning question on every young engineer's mind--how do skyscrapers stay standing?--readers discover the important designs used to build tall buildings. Links to primary sources for kids offer a unique, interactive learning experience, while, while fun facts, engaging illustrations, timeline, glossary, and lots of resources keep kids wanting to learn more about the engineering design process. Explore Skyscrapers! is part of a set of four Explore Engineering books, in which readers ages 7 to 10 develop foundational understanding of the physics that guides the building and maintenance of bridges, canals, dams, tunnels, and skyscrapers. Other titles in the Explore Engineering set include Explore Bridges!, Explore Canals and Dams!, and Explore Tunnels! Try these hands-on STEAM activities! In Skyscrapers! With 25 Science Projects for Kids, kids ages 7 to 10 learn about the principles of engineering that are used in building skyscrapers, as well as the history of skyscrapers themselves. To answer the burning question on every young engineer's mind--how do skyscrapers stay standing?--readers discover the important designs used to build tall buildings. Links to primary sources for kids offer a unique, interactive learning experience, while, while fun facts, engaging illustrations, timeline, glossary, and lots of resources keep kids wanting to learn more about the engineering design process. Skyscrapers! is part of a set of four Explore Engineering books, in which readers ages 7 to 10 develop foundational understanding of the physics that guides the building and maintenance of bridges, canals, dams, tunnels, and skyscrapers. Other titles in the Explore Engineering set include Bridges!, Canals and Dams!, and Tunnels! Chapter One: Why Do We Need Skyscrapers? Chapter Four: Let the Building Begin! Skyscrapers: Investigate Feats of Engineering with 25 Project School Library Journal: "Large font and an open layout make this title accessible to reluctant readers. Kids will appreciate the boxed 'Words to Know' sections embedded on most pages that highlight new vocabulary. 'Did You Know?' sidebars also appear throughout and showcase interesting facts and anecdotes. Simple black-and-white illustrations enhance the narrative and break up the text. The scientific concepts are explained with easy-to-understand and kid-friendly examples. The 25 activities can be easily replicated at home, school, or in a library STEAM program, and require items that can be found at a grocery or hardware store. Projects include creating a step pyramid out of sugar cubes and engineering a skyscraper out of spaghetti noodles and mini marshmallows. Latham adheres to the scientific process and encourages young scientists to make predictions and assess their results along the way. This would be a useful title to supplement lessons on architecture, mathematics, or physics for classroom teachers or homeschoolers, and it's an appealing initiation to the subject." Explore Simple Machines! With 25 Great Projects Booklist ." . . Yasuda writes in particularly clear, simple language, and intersperses her explanations with historical notes, jokes that even the target audience will find laughably lame ('What did the apple say to the wedge? You split me up!') and 25 easy projects or demonstrations constructed from common materials. She also repeatedly urges readers to spot and classify the simple machines that are all around, encourages the use of a science notebook, and closes her discourse with descriptions of what inventors and engineers do. Illustrated with simple black-and-white cartoons and capped with well-considered lists of print and other resources, this makes a serviceable hands-on guide to the topic." Elizabeth Schmermund is a writer, editor, scholar, and teacher. She has written more than 15 books for students and young readers, including Architecture: Cool Women Who Build Structures for Nomad Press. She lives in the New York metro area with her family. Mike Crosier holds an MFA from the Center for Cartoon Studies. He is the illustrator of several books from Nomad Press, including Explore Greek Myths! With 25 Great Projects and Video Games: Design and Code Your Own Adventure. He lives in White River Junction, Vermont.